Astrophysicist Neil deGrasse Tyson is a familiar face to science buffs as well as those who can’t tell a quark from a quasar. Over the years, Tyson, the Frederick P. Rose Director of the Hayden Planetarium in New York, has reached astronomical heights on social media, amassing more than 5 million Twitter followers and becoming as much a pop culture fixture as a world-renowned expert in cosmology. In his popular radio program and podcast turned Emmy-nominated late-night TV talk show, “StarTalk with Neil deGrasse Tyson,” he has found an effective way to meld both worlds, bringing together a wide range of public figures – from movie stars to researchers, authors to Olympic athletes – to geek out over science. The third season of the show debuts Sept. 19 on National Geographic Channel with Whoopi Goldberg as the guest, and it coincides with the publication of “StarTalk: Everything you Ever Need to Know About Space Travel, Sci-Fi, the Human Race, the Universe, and Beyond,” a new hardcover book that highlights some of the funny, fascinating, and at times strange topics explored on the show. Ahead of the new season and book launch, Tyson spoke with CBS News about the show, his alternate-universe persona as a musical theater composer, and why he feels “science is relegated to the backwaters” each election cycle. Q: Just looking at the list of guests this season, it’s hard not to notice the broad range of people, from Buzz Aldrin to Hope Solo to Whoopi Goldberg. How are guests selected each season? A: We aren’t always aware of the fact that science touches everyone’s life. When we are selecting interviews, we aren’t looking for great conversationalists. It’s fine if it’s true, but our best interviews come from when you know someone for some set of reasons – maybe they are athletes or actors – but you did not know that they have some hidden, deep underbelly that reveals how important science is to them. You didn’t before know what role science played in their livelihood. If you know who this person is, you are a fan of theirs, then you’ll follow them to “StarTalk” and will hear our conversation. A lot of people wouldn’t hear a conversation about science that day. They probably didn’t hear a conversation about science since they sold their last science textbook in college. That’s what scientists do – we reveal how prevalent, how persistently science matters to everything, how much it matters to society as well as pop culture. Q: Who was the one guest who surprised you the most with his or her science knowledge? I was ready to just have a conversation with an acrobat, but then I learned how he started, it was through his family, his lineage. I learned that ... in there is someone who is deeply philosophical about what he does and why. He said that he doesn’t worry about falling, he said something like ‘only I and the wire exist, and in my head I’m not falling to anywhere – all that matters is me and the wire, and that’s all that it is.’ I realized this is a different kind of person from the rest of us, and taken his point of view, you could see that he made his art a philosophical endeavor. It was all about the philosophy of life and risk and of celebration. So, I would say I was delightfully surprised by how much more we able to get out of that conversation. Neil deGrasse Tyson on the science of "The Martian"
Another person who surprised me is Terry Crews. There isn’t anyone who doesn’t love Terry Crews He’s interested in fine art, he used to make photorealistic images when he was in the NFL – pictures of athletes holding the football. We also talked about what role science played in football. He liked physics in high school. It’s interesting to hear what could be similar to your own background from these people, how people’s life trajectories take them from one point to the other. It’s fun learning about people. I’ve had publicists snarling at me about promoting different things, but I’m trying to reach this audience, cultivate the conversation and let it run its course. Hopefully everyone walks out a bit more enlightened. Q: So, in an alternate universe, if Neil deGrasse Tyson was being interviewed on “StarTalk,” what would be the surprising thing we’d learn about him? A: I have a secret passion for Broadway musicals (laughs). One day, I would love to write the songs and libretto for a musical. In this musical, I would want to write the perfect sentence where boy meets girl. Well, I guess that would be a little heteronormative. Well, two people meet one another, fall in love, but words no longer suffice, words break out in song. The words in the song would convey the depth of emotion. I have deep respect for language, for words, for poetry. I dally in it when I write my books, but only one in 10 sentences is ever that great – I need to up that fraction! 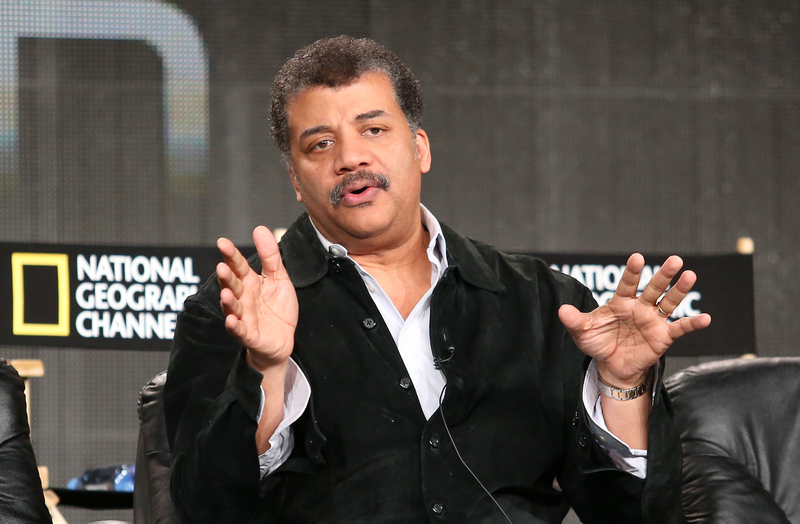 Q: Who knew Neil deGrasse Tyson had a soft spot for musicals! Q: Being able to distill complex ideas in a short tweet seems to be something you really excel at. In a way, does that tie in with your show’s goal of trying to democratize science – to package it in a digestible, understandable way for people? A: Well, not only in an understandable way. All educators do that. We try to add to that equation. You come to us, and you find this show in the scaffold of pop culture, we train you to understand pop culture, and you’re already comfortable with that. Now, you are halfway there, come to this studio that is clad in this scaffold, and then you find science attached to things you already have fluency. You come out realizing science is part of everything you do, everything you value as part of a civilization. We’re making it easy to understand and not dumbing it down. Q: When you first moved into this pop culture realm, was it hard for you as a researcher to figure out how to attach this scaffolding, if you will, to some of the topics and subjects you have always been passionate about? Was it hard to find the right language? A: That’s an interesting question. I was always pretty socialized, and I always generally had some awareness of pop culture. Always the hard part is staying current on this broadening platform of pop culture influences. I have seen “Game of Thrones,” I have seen “Empire,” I have seen “Orange is the New Black​.” I know what they are about. I see these activities that I engage in as loading up my utility belt of exploratory powers. If you know what the Super Bowl​ is, if you watch it, you have a quick lesson on momentum transfer when a linebacker slams into a running back, for instance. Q: I’m looking at your Twitter right now and see the tweet you had from August where you write, “Could use a new ballot choice: ‘None of the Above.’ If it beats the leading candidate then all new people must run for office.” I know you’ve been outspoken about politics in your social media. What do you think of this election? It seems neither Donald Trump​​ nor Hillary Clinton​ have made space, for instance, a priority. Has science been addressed enough? A: That’s a problem in every election – science and space are never discussed. Science is relegated to the backwaters of presidential debates. The economy and other things are pushed forward. Everyone thinks the economy comes before science and innovation, but it’s really the cart being put in front of the horse there. In terms of this election, I’m fascinated by how much Donald Trump is getting attacked when your gripe is not with him, your gripe is with his followers. You attack him, but there’s still the matter of his followers. You could give him a one-way trip to Mars​, and you’d still have his followers​. They like him, they want him to be their leader. The objection is to your fellow countrymen, fellow people who have just as much a right to vote. Are they educated differently? Are they ignorant? You have to fill in the gaps and do something with the educational system. You have some people objecting to Hillary because she’s a woman. We focus so much on the candidates, but they are the tip of an iceberg. Some people are spooked by having an underrepresented minority president. You have to do something to the educational system. I have this kind of contrarian view of the election where, vote for who you want, but we aren’t doing anything about reforming the education system​​ and we should be looking into how people receive or learn information. Q: I spoke with your colleague Bill Nye​ last month and he expressed similar thoughts on science being pushed to the side too often in politics. A: In my tweet you mentioned, I was citing Australia, where everyone is required to vote lest you pay a fine. You’re required to vote and they give you an option “none of the above.” In that way, “none of the above” becomes an active statement of the electorate rather than a passive statement. There could be real political value knowing the public is dissatisfied by the candidates. I posted it as a suggestion. Q: What can be done to bring science more to the forefront in political debates? A: The public has to want it and the press has to believe the public wants it. I bring it back to the educational system. We don’t think of how important a role science​ plays in shaping a civilization. Science​ could be taught differently, as a means by which we invent a tomorrow​. We need to have emerge from the educational pipeline a different sense of things, a different portfolio of what people vote for.